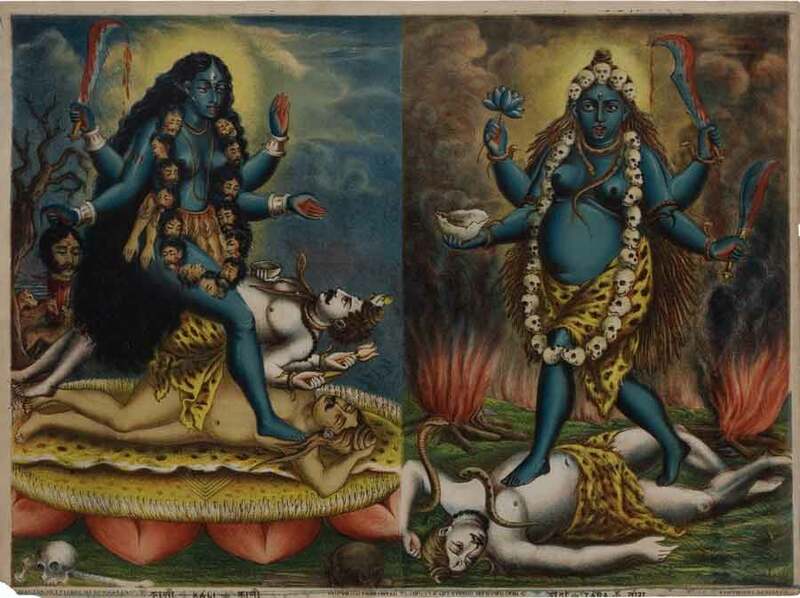 India’s first lithography presses, founded in the late nineteenth century, were devoted to printing images of Hindu gods and goddesses. These early lithographs were printed from limestone blocks with images hand-drawn on as many blocks as there were colors to be printed. The stones, each inked in one color, were then printed in succession. By the late 1930’s to mid 1940’s this technique was replaced by photo-offset printing. 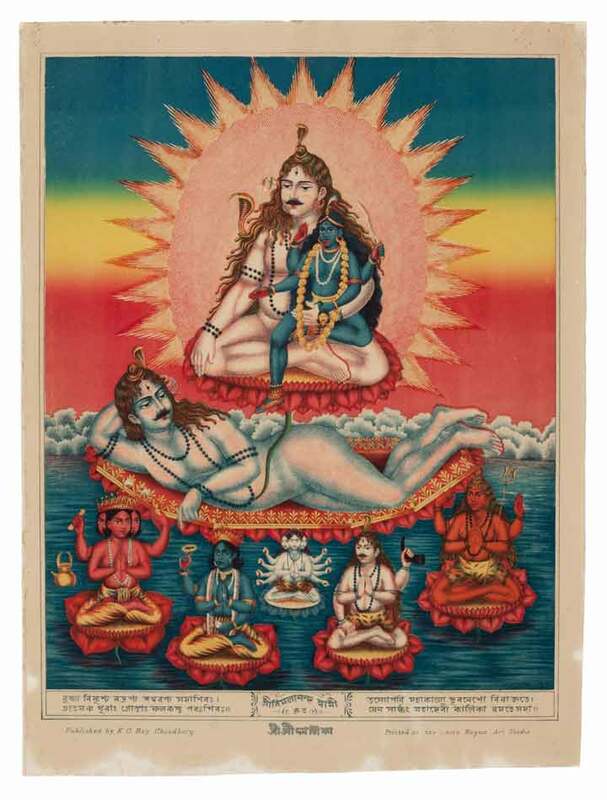 Through years of hard work Mark Baron and Elise Boisante have formed one of the world’s most comprehensive collections of important 19th and early 20th century Hindu mythological prints. Prints from their collection have been acquired by the Metropolitan Museum of Art, The Museum of Fine Arts, Boston, the Spencer Museum of Art, University of Kansas, The Davis Museum at Wellesley College, The Library of Congress, and The Crow Collection of Asian Art, Dallas. Vikram Zutshi: Describe the God print collection for our readers. What distinguishes them as a signature style and what are the sources? 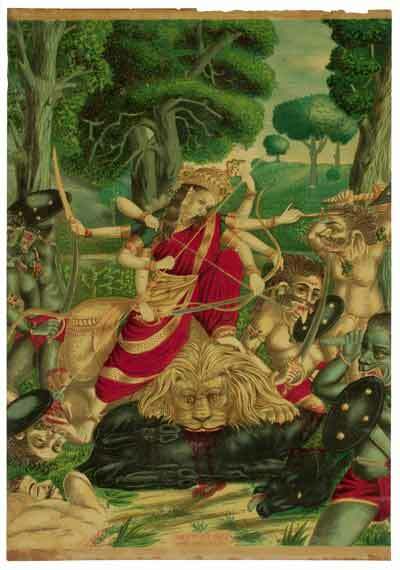 Mark Baron: India’s Hindu god and goddess prints go back about a hundred and fifty years. 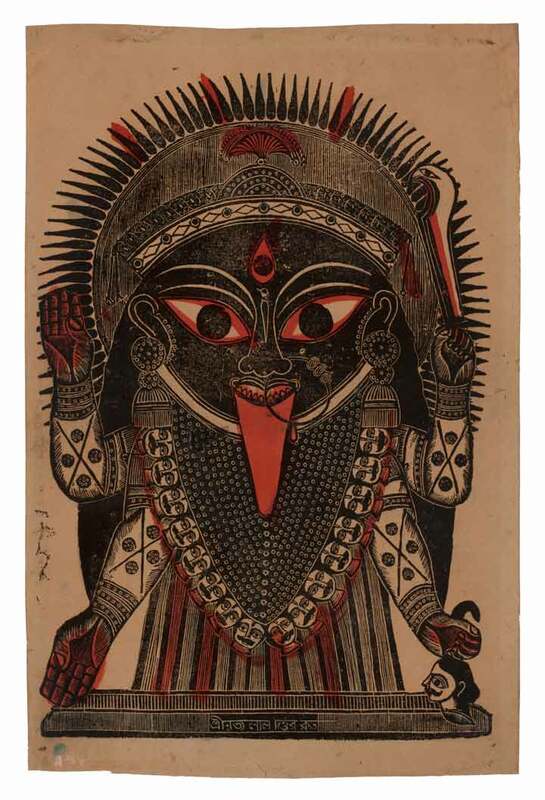 Our collection focuses on the first fifty years, starting with mid-19th century woodblock prints from Calcutta. 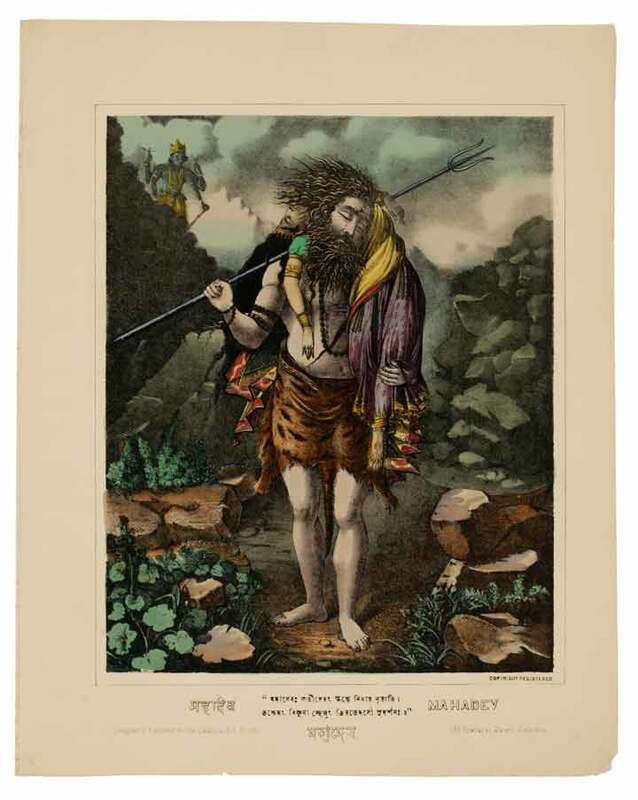 We have a large collection of 19th century lithographs, many hand-colored, from early Calcutta publishers/presses such as Calcutta Art Studio, Hindu Art Studio, and Chore Bagan Art Studio, from Bombay’s Chitrapriyaprakesh Press, and Chitrashala Press in Pune, as well as prints which were self-published by artists such as Kristo Huri Das and Shew Cobind Lall. Vikram Zutshi: What made you embark on the journey to find the prints? Where did it lead you? Tell us some highlights of your travels across India. Mark Baron: We became interested in these prints during the first days of our first trip to India. Elise and I both have a background in prints. Elise began dealing in European and American modern and contemporary prints in the early 1980’s. I began publishing prints and multiples by a small group of artists in 1985. In 1988 we opened Baron/Boisanté Gallery on West 57th Street, in New York, specializing in prints and drawings. 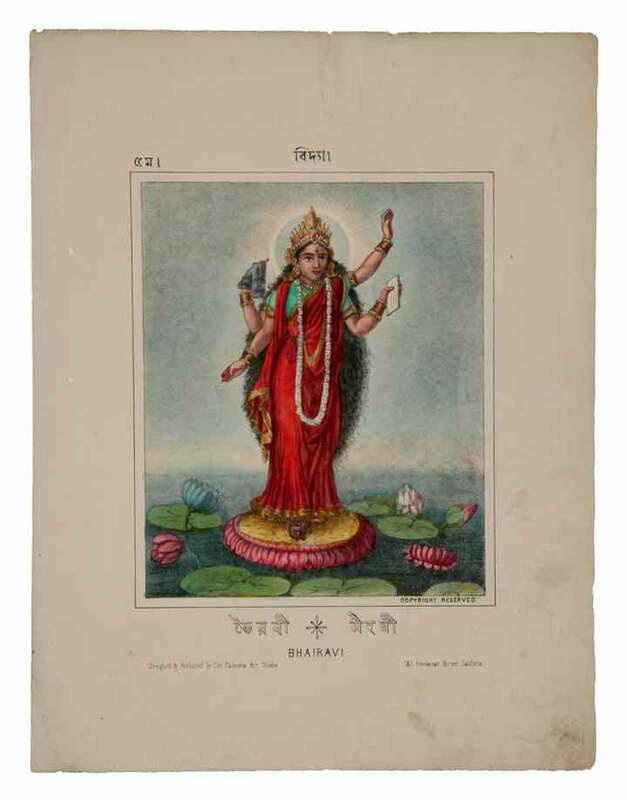 So, of course, we were fascinated by the classic prints from Ravi Varma Press and Brijbasi and Sons which were hanging on the walls of old shops and merchant’s stalls. On that first trip we arrived in Mumbai and traveled for two months, south through Maharashtra, Goa, Karnataka, and Kerala, up through Tamil Nadu, and throughout Rajasthan and we looked for old prints wherever we went. By the end of the trip we had a small collection of fairly recent prints in terrible condition, and we were hooked. Little by little we learned the history of these prints and found sources for earlier and earlier examples, buying them at first from old print dealers, then from antique shops, and then from private dealers in remote areas. If we can find an area which was wealthy during the 19th century, when these prints were made, an area which is now remote and more or less a ghost town, and if it is an area with fairly low humidity, and it has not been combed through by dealers for years, then we have a chance of finding early and important prints. 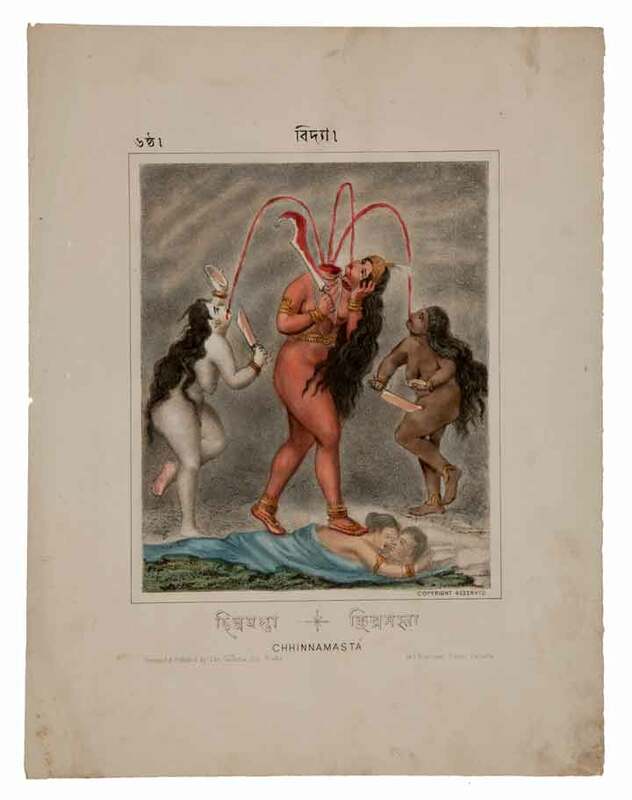 Conditions are very important, for instance, 19th century Calcutta prints have not survived in Calcutta because these prints were all printed on acidic paper and the average humidity in Calcutta, throughout the year, is over 70%, so the old prints in Calcutta have literally crumbled. 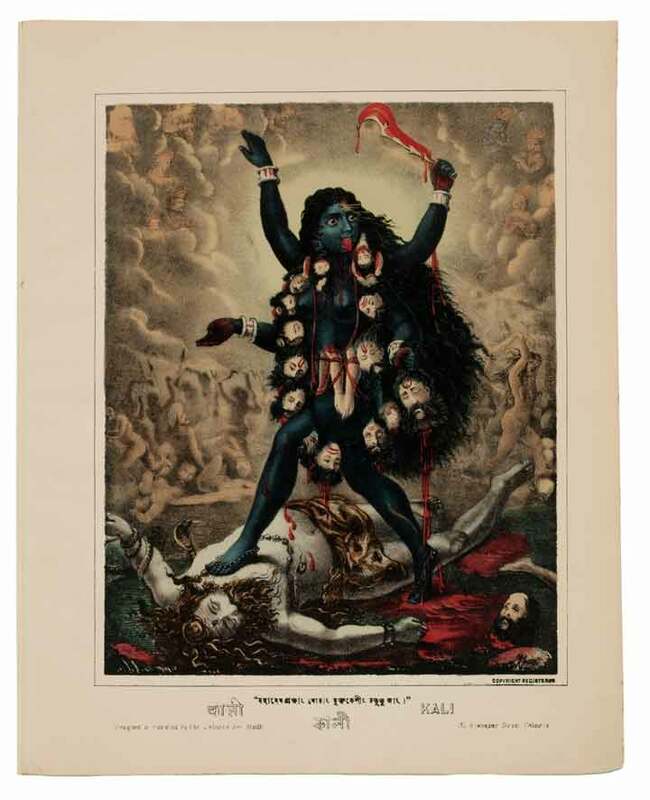 We have also purchased important prints from collectors in Europe and the U.S.
Vikram Zutshi: Who is Ravi Varma and what role did he play in depictions of divinity in twentieth century and contemporary India? What were his influences? 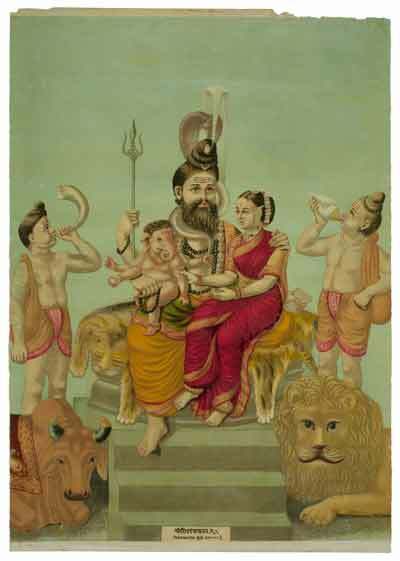 Mark Baron: Ravi Varma was an Indian painter who worked in oils on canvas in a European style. 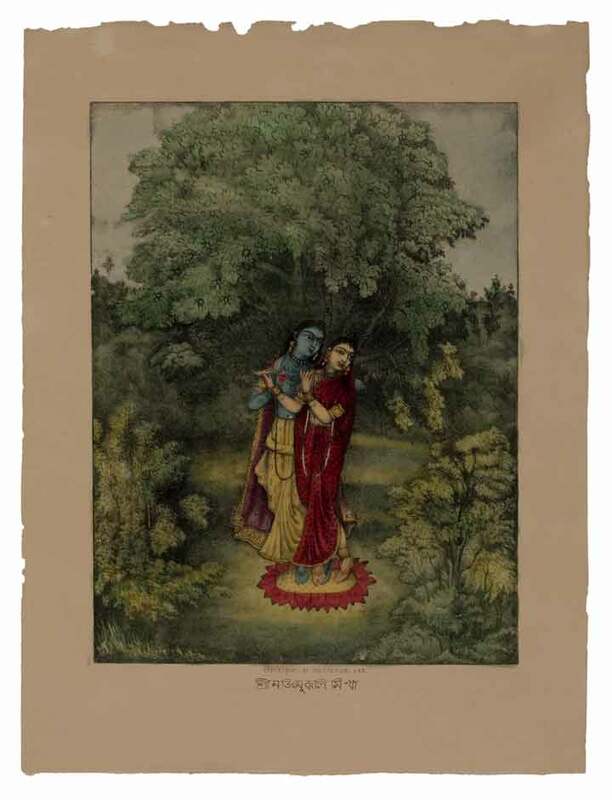 His paintings are not of great interest to us, but in 1894 he founded the Ravi Varma Fine Art Lithographic Press and published some wonderful prints which quickly became classics. 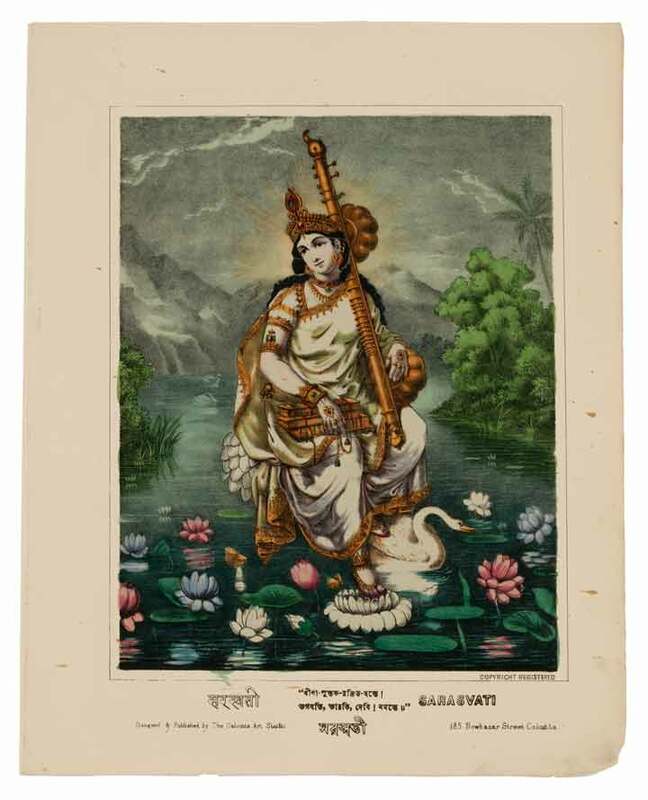 For many years, because of his celebrity, most Indian print collectors were only interested in Ravi Varma Press prints. 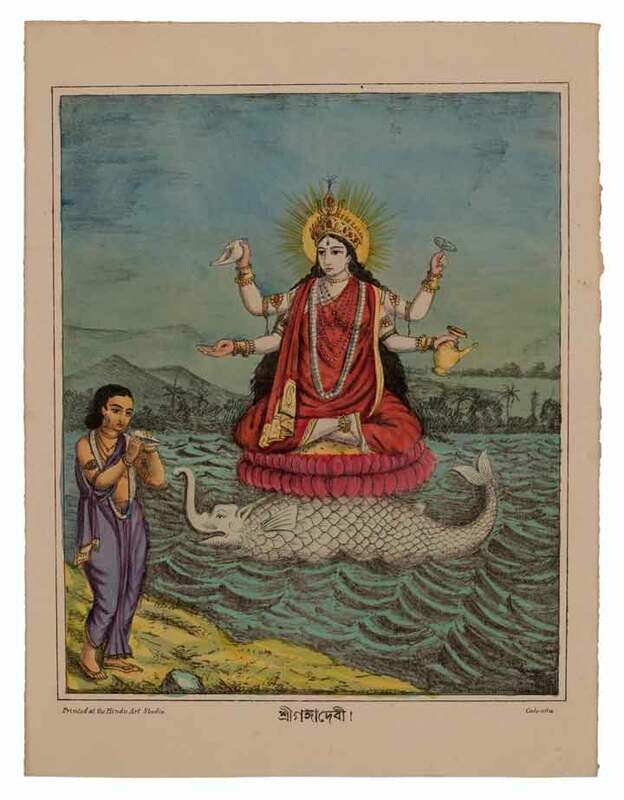 Since we were primarily interested in earlier prints, this was a wonderful time for us to collect, The Golden Years, when any print which was not a Ravi Varma print could be purchased for next to nothing. 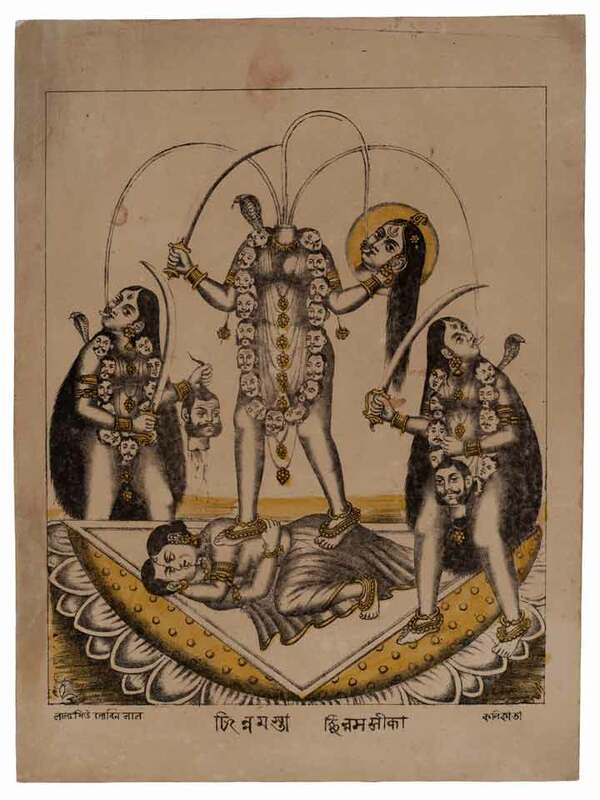 This has changed in a big way in the last five years or so, as more and more Indian collectors have turned their attention to the earlier Calcutta prints. 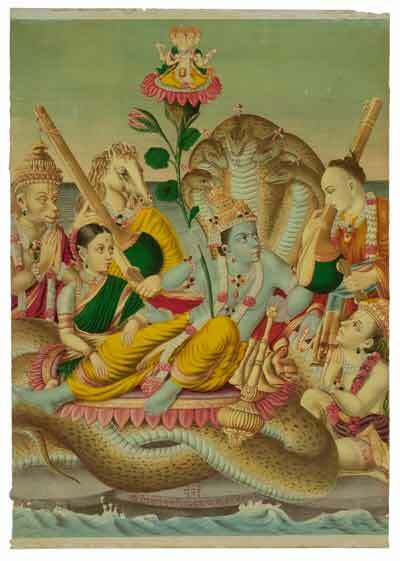 Three or four years ago a gallery in Delhi offered us a very beautiful 19th century hand-colored lithograph of Ganesh for rupees 4 lakh, about $7,600. at that time. The price of this one print was about five times India’s per capita income! We knew things were changing, but this was really a wake up call. Vikram Zutshi: What are your early religious influences? 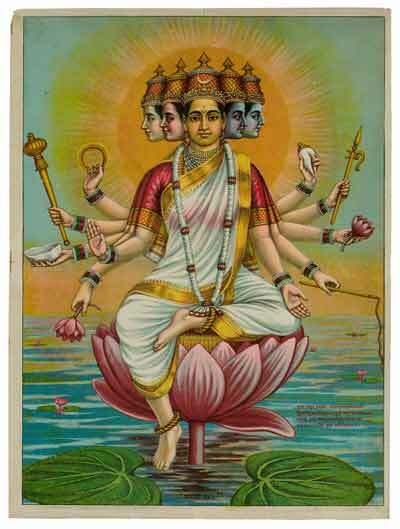 How were they influenced by your exposure to Indian spirituality and Hinduism? 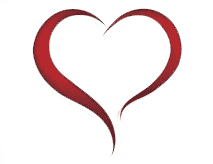 Mark Baron: Elise and I both had secular upbringings, Elise’s parents, from a Jewish and Catholic background, and mine, both from a Jewish background, were atheists. My exposure to Indian spirituality and Hinduism has led to an interest in Buddhism, which I have studied to so some degree since our first or second trip, for approximately fifteen years. I wouldn’t call this study of Buddhist teachings a practice, it’s not very rigorous, and through the years it’s been off and on, but these teachings do have deep meaning for me. Elise has also been greatly influenced by Indian spirituality and Hinduism, and I think anyone who experiences the love and devotion of the Bhakti path must be affected in some way. Vikram Zutshi: For Plato, representation, like contemporary media, intervenes between the viewer and the real, creating illusions that lead one away from "real things". One apprehends reality only through representations of reality, through texts, discourses, images. However Reality is always more extensive and complicated than any system of representation can comprehend, and we always sense that this is so-representation never "gets" reality, which is why human history has produced so many and changing ways of trying to get it. Mark Baron: We are only lead away from “real things” by representations if we misunderstand of the nature of those representations, if we understand that a flower is a flower and a painting of a flower is a painting then there is no issue of our being led away from the flower. We can go a step further than the question of representations of reality through texts, discourses and images, all “reality” is experienced through representations. The colors and form of a flower create reflections of light which our eyes turn into impulses processed by our brain to re-present the flower as a mental image. An approximate mental image. But this mental image is something else, for sure, but it is just as much reality as the flower. In order to directly experience the flower we would need to be the flower (sounds like I’ve got the pot). Vikram Zutshi: What are the principal differences between sacred art from indigenous non-western cultures and modern (secular) art? What did art mean to pre-modern societies as opposed to the postmodern man? Mark Baron: Sacred art has a purpose; secular art does not need to have one. I sometimes feel the need for a place where purpose is unnecessary, an escape from rules and logic, and I can find that place in secular art. And I sometimes have the need for a place where I can share feelings of love and faith, sacred art can provide that place. Elise Boisanté was born in Paris, and has lived in New York since 1978. She was a partner in Gallery Schlesinger-Boisanté, founded in 1981, specializing in modern and contemporary art. Mark Baron was born in New York. He worked for numerous galleries during the 1980's and began to publish prints and multiples in 1985. In 1987 Mark Baron and Elise Boisanté formed Baron/Boisanté Editions, to publish prints and multiples, and they opened Baron/Boisanté Gallery on 57th Street, New York, in 1988. 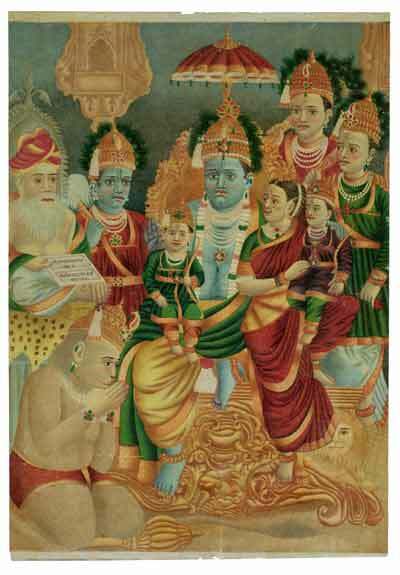 They discovered Hindu mythological prints on their first trip to India, in 2000, and have since made almost yearly trips to search for early examples. In 2012 much of their collection was reproduced in Richard Davis' book Gods in Print , published by Mandala Publishing. Recently they have become dealers as well and prints from their collection have been acquired by the Metropolitan Museum of Art, the Museum of Fine Arts, Boston, the Spencer Museum of Art, Kansas, the Library of Congress, and other public collections. Currently they are collaborating with film maker Rachel Fedde who is making a documentary about the history of Hindu god and goddess prints.